Sunday, 5:30 am. McCarran Airport in Las Vegas. It still hasn’t sunk in that for the first time since 2006, there is a new middleweight champion in the UFC. That’s not melodrama, not a moment to sigh for the “good ol’ days,” just a realization that the MMA landscape has changed quite considerably since Chris Weidman’s second round knockout of Anderson Silva on Saturday night. You could go even further and say the sports landscape has changed, because I’ve never woke up to so many texts from friends who are casual fans at best asking about the fight, or had so many people at the airport see the UFC on my bag and ask what happened with that Silva guy. So what happened? He gave Weidman his chin on a platter and the New Yorker took it. It doesn’t get any simpler than that. Silva didn’t show up to the MGM Grand Garden Arena and fight like a 38-year-old is expected to, aging overnight. He wasn’t steamrolled by the New Yorker and pounded into a one-sided defeat. No. He dropped his hands, showboated, and stuck out his chin like he had so many times before. But this time his sin of leaning straight back to avoid a punch caught up to him. This wasn’t the Forrest Griffin fight, where he pulled off the same antics and wound up knocking the newly minted UFC Hall of Famer out. This wasn’t his bout with Demian Maia, where his venomous taunts were only addressed in the closing stages of the fight, when it was too late. Weidman was young, fast, determined, and – for the moment – angry at being clowned by the Brazilian legend. He was going to keep punching until he hit something, and when I spoke to Weidman’s longtime coach Ray Longo Saturday night, he said his advice to his charge was to stop aiming for Silva’s chin and instead “punch a hole in his chest.” When Weidman followed that advice, his hole punching intentions strayed upward, found Silva’s jaw, and seconds later, it was game over for a reign that lasted over seven years and ten successful title defenses. That’s the bad news. The good news is that the 185-pound weight class is suddenly wide open, Silva’s Hall of Fame worthy legacy doesn’t take a hit, and he appears that he is still a threat to not just return to his winning ways, but to regain his title should a rematch take place. And yeah, that rematch will make him a boatload of money. The other positive to take from the upset is an obvious one - the arrival of Chris Weidman. As a New Yorker, I’ve been hearing about Weidman long before he made his UFC debut, and when there were some scoffing at him making his UFC debut after just four fights (and on short notice no less), those here on the east coast smirked. He was ready for the UFC, and his first five fights (and wins) here proved it. But after nine pro bouts, is anyone ready for Anderson Silva? When asked about the fight in the days and weeks leading up to UFC 162, I said that Weidman has the talent to beat Silva, but I wasn’t sure that he had the experience. When all you’ve seen since June of 2006 is brilliance, with the exception of two rough outings with Chael Sonnen (both of which Silva finished anyway), there wasn’t much to hang your hat on when it came to calling for the upset other than Weidman’s wrestling-based style and the idea that eventually Father Time catches up to all fighters. My theory was that the only one that could beat Anderson Silva was Anderson Silva. And I was right. Just not in the way I expected. The way I saw it, Silva’s greatest tool was his ability to translate his talent into a confidence in the Octagon where he didn’t believe that someone had the nerve to, as Mike Tyson once said, “challenge me with their primitive skills.” The man Silva dethroned for the 185-pound title, Rich Franklin, told me that Silva makes “good fighters look bad,” and I’ve never heard a more accurate breakdown of the 16-0 start to his UFC career. 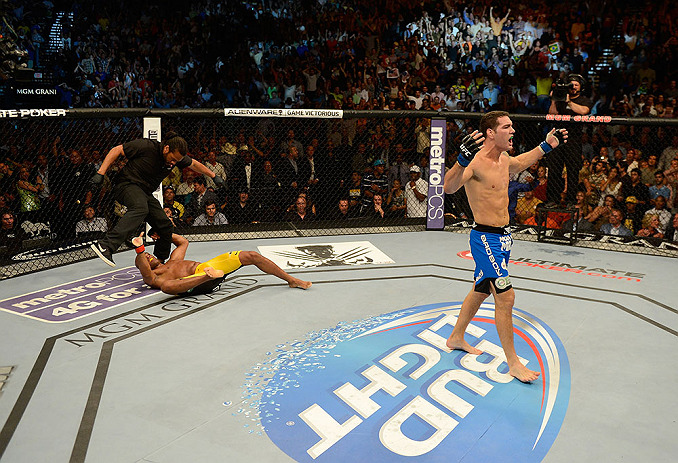 Weidman believed though, and as early as his first couple UFC fights, he knew he had what it took to beat Silva. It wasn’t a ploy to get the fight made, pick up a nice payday, and fade away into life as a mid-tier contender. He really thought he could win. Even through all the pre-fight hype, through being picked by several peers to win, and through all the fight week festivities, Weidman kept focused and stuck to what he had envisioned a thousand times in his head: winning the title. And while the first round went well enough for Weidman on the ground, by the end of the round, Silva was standing, taunting, whipping the crowd into a frenzy, and appearing to get into Weidman’s head. The Brazilian looked to be in complete control at the moment, and it carried over into the second round. And that’s where he lost his way and lost his title, allowing his confidence to sway into arrogance. You could say that his reflexes aren’t as sharp at 38 as they were ten years ago, but I’m not buying that as an excuse. What I saw was a Silva forgetting that as good as he is, everyone he faces in the Octagon with four ounce gloves has the talent to put his lights out. On Saturday night, Chris Weidman did just that. It was shocking, but it wasn’t a fluke. And while it’s not the way you want to see any great champion go out, I’ve got a feeling it won’t be his final exit.